It was indeed a pleasure to read “Ineligible Receiver” (Winter 2012). The article brought back memories of my days as an undergraduate from 1945 to 1947. Many people in those days thought the University was strictly for studying. That was not so. 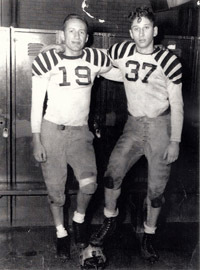 While football had been discontinued approximately five years prior, the University restarted its football program on a very modest scale in 1945. It was really intramural in nature, with each house at Burton-Judson having one of the teams. However, players were not strictly limited to each of the dormitory houses. Anyone at the University could join in, and many people did so. I played for what was then Mathews House. Surprisingly, a number of those who joined the teams had played football in high school and were stellar performers. It was a most enjoyable time. The secondhand equipment with which we were furnished had been used when the Maroons played intercollegiate football. It was not the newest, but we made do with it. Practice and the games were held on Stagg Field. Imagine the history that went before us. It was quite exciting. My recollection was that Kyle Anderson was the head coach and in charge of the program. His assistants were also part of the athletic program, which was still active in Big Ten sports, including basketball. What an honor to discover upon reading “Centripetal Force” (Winter 2012) that I shared the University’s campus with one of my roller derby idols, Varla Vendetta. Thank you for bringing roller derby to the attention of the alumni community through this profile of a talented athlete who proved her prowess on the world stage in a history-making moment for our sport. I wonder how many other graduates’ lives have been changed by competing on the flat track. I know I count myself among them. The story about the Odyssey Project (“Free Thinking,” Winter 2012) was a wonderful tribute to Earl Shorris, X’53, the man who founded the Clemente Course in the Humanities, of which the Odyssey Project is a part. It is with profound sadness that I write to let your readers know that Earl lost his long battle with non-Hodgkins lymphoma on Sunday, May 27. But all who knew Earl realize how hard it is to capture the special magic of that extraordinary man, a Renaissance man if ever there was one. Perhaps the best tributes will come from the many adult learners who have had their lives transformed by the Clemente Course/Odyssey Project, and their voices are the ones that Earl would have most wanted to hear. He received many awards during his lifetime—in addition to the National Humanities Medal, he was honored with the Mexican Order of the Aztec Eagle, a very special distinction—and his books and articles have often met with wide acclaim. (See, for example, Under the Fifth Sun, The Life and Times of Mexico, and New American Blues, works of which he was especially proud.) But his greatest work, in his eyes, was the Clemente Course/Odyssey Project and its success in providing “riches for the poor,” as another of his works put it. He loved the article in the Core—writing to me, “What a great cheering article that was!”—largely because in it one could hear the voices of the Odyssey students and feel the excitement of the humanities in action. He was a great friend of the University’s Civic Knowledge Project, and all of us at the CKP will miss him. He taught freedom, like no one else we have ever known. Thank you for your lovely article on the Odyssey Project. I think Carrie Golus captured the spirit of the class very well—especially in the felicitous designation “its intriguing mixture of elitism and populism.” The only thing missing was a mention of our partner, Bard College, which has been granting credit to graduates of the Clemente Courses since the late 1990s. After Earl Shorris died at the end of last month, I received a number of notes from former students in the project, and I would like to share a couple of them. It has been my privilege to work with the Odyssey Project since 2000, when Earl Shorris came to Chicago to get the first course started here. At the time, I was teaching in the Basic Program of Liberal Education for Adults in the Graham School and tutoring adult literacy at the Blue Gargoyle, wishing the Blue Gargoyle students had the same opportunities for reflection and discussion that the Basic Program students had. I couldn’t figure out how to do it, but Earl did.